However, the theoretical limit to understanding objective phenomena is always there to the extent that the observed phenomena is based on the very nature of the observer. It is not clear how precisely the relationship between the subject and the object can be determined scientifically. Philosophically, this is due to the logical difficulty of separating the subject from the object and demonstrating their independence. Science of the Self, however, is a radical departure from the physical sciences and has a different aim. Here attention is directed inwards towards the subject and not outwards towards objects of perception. 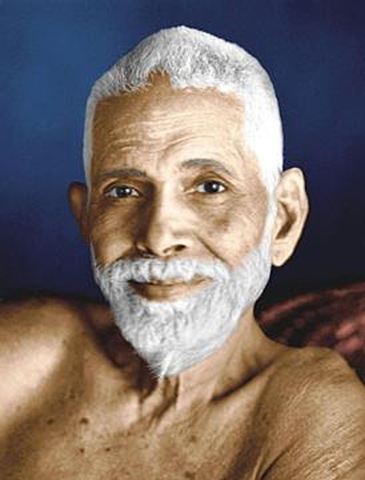 The classic methodology given by Sri Ramana for Self-Inquiry is to ask oneself with attention and inquire, “Who am I?” This is done in order to introvert the mind and drive it deeper into its source. In Self-Inquiry, the quality of consciousness itself becomes the center of attention. In this method, consciousness is not focused anywhere or on anything other than itself. Language is not perfect but there are many ways to say this. Attention focused on attention itself is Self-Inquiry. Consciousness becoming self-focused is Self-Inquiry. Mind turning inwards to its source is Self-Inquiry. Awareness aware of itself is Self-Inquiry. All of these are variations of the same process and basically refer to the same thing. These statements indicate that one should quietly abide in one’s own sense of identity and being with full awareness. This is not an easy notion to grasp. The Self-Inquiry methodology does not present the aspirant with an image or a sound to concentrate on. Because we are so dependent on our sense of hearing and sight even for meditation and prayer, Self-Inquiry presents a challenge. People often find it difficult to know what to focus in doing the Self-Inquiry because they associate their identity and thus consciousness strongly with the body. This is why Sri Ramana used to say that Self-Inquiry is not for everyone to take on immediately. I have observed this phenomena carefully for a long time. People find meditation, yoga, tantra, chakras, and kundalini methods much more interesting and exciting to talk about and practice than Self-Inquiry. It is because all of these Yoga systems are directly or indirectly based on producing changes in the physical or the subtle bodies which one can experience. Consumption of experience in some form or another is natural to all living beings. Self-Inquiry points, however, to the subject; the one who experiences. What is the nature of the one who experiences? Self-Inquiry shifts our attention from perception to the perceiver. Who is the one who perceives and experiences reality? The practice of meditation and yoga leads the mind to temporarily withdraw the senses from objects of perception. However, internal perceptions in meditative states or Samadhi will most likely still exist. These internal perceptions may manifest in a number of ways including that of visions of angels, holy sages, the Goddess. Various spiritual and religious symbols often appear spontaneously in the mental eye of the aspirant during meditation or contemplative prayer and there may also be experiences of lucid dreaming states. So even in higher meditation states, the distinction between the subject and the objects of perception continues as we engage in and consume one experience after another. Self-Inquiry, on the other hand, is found to be boring and irrelevant by many people because it promises them no special experience to enjoy other than being their own self. People should always do what feels natural. Nothing can be forced. Eventually with the practice of meditation and other types of yogas, the mind becomes more subtle. The understanding of the nature of consciousness as free from outer perception (of physical objects) as well as internal perceptions (dreams, visions, other mental experiences) can then start to emerge. Once the independent nature of consciousness (free from all perceptions) is understood, one can recognize the essential quality of existence and pure being in the midst of various experiences. When attention/awareness become self-focused, that is called Self-Inquiry. When attention lights up attention, awareness lights up awareness, consciousness lights up consciousness, Self is Realized as Sat-Chit-Ananda, the ultimate subject, the very core of being. Sri Ramana called it simply the Heart, whose nature is that of silence which is beyond all understanding. A popular dichotomy has emerged about Enlightenment in the West since the 1970s between the schools of “gradual enlightenment” and “instant enlightenment”. Some of this can probably be traced back to Poonja ji’s and Nisargadatta Maharaj’s disciples returning to the west in the 1970s and 1980s from India and bringing their understanding of Advaita Vedanta with them as given to them by their teachers. However, because many of these students deviate from traditional Advaita as taught in the classic lineage of Adi Shankracharya, they are referred to as neo-advaitins. It is said that there are two approaches to the Truth of Being or Reality which some call Enlightenment or Self-Realization. A gradual path and a direct path. What is the truth of it? Are their really two paths? If not, which approach is the correct one? What road should a seeker of truth take? First we look at the two paths and what these are about. In the gradual path, one engages in meditation and other spiritual practices and disciplines, refines and purifies the mind over time, and is able to rise above the body limitations in ecstatic and trance states. At some point, the mind beholds the divine directly or is able to surrender itself and be absorbed in the divine. Most yoga paths in various Eastern traditions fall into this category. One can check the ancient Patanjali’s Yoga Sutras for reference. Such schools of thought are also common to Hinduism, Buddhism, Jainism, and other religions as well. In these traditions, personal prayers, effort, and practice to reach the supreme divine is emphasized and considered vital to success on the spiritual path. 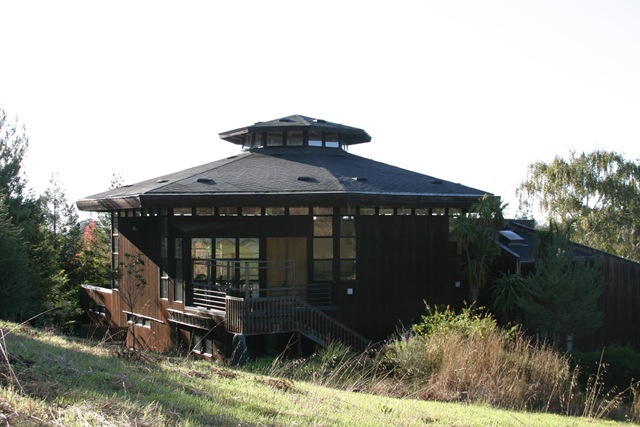 The yogic paths and meditative approaches based on effort are criticized by the proponents of the direct path (the neo-advaitins) as being misguided. The advocates of the direct path point out that since Advaita Vedanta states that the Self is always realized, expending effort to find it, is itself counterproductive. Their essential position is that since any effort towards enlightenment is based on ignorance, it cannot lead to true understanding or Enlightenment. If I were to frame the objection of the neo-advaitin to the gradual path in the form of a question, it would be this: ” How can spiritual effort based on the false assumption of ignorance lead to the Truth of Reality?”. Logically, It is a quite a beautiful and a powerful assertion. On the other hand, the “direct path students and teachers” are viewed by many traditional yogis and practitioners of meditation as deluded individuals who at best have convinced themselves due to the power of sheer ignorance that they are enlightened. Such self-deception in the long run is bound to prove frustrating and disappointing to themselves as well as those unfortunate enough to fall for their hype of “Instant Enlightenment”. Many traditional practitioners also claim that the “direct path teachers” tend to be on power trips and underneath the facade of their “Enlightenment” lies the basic human nature of greed and the hunger for power and the usual sexual and financial exploitation of those who follow them. They point to numerous examples of this happening in various spiritual communities and satsangh circles. Unfortunately, the traditional practitioners and gurus are also not free from such issues. So neither can win the argument on the ground of excessive purity in behavior and conduct. Such criticisms and counter-criticisms that the practitioners of two schools hurl toward each other all appear to have some degree of validity. Both schools also have their own particular strengths. An integrative understanding can lead one to relax one’s position on such matters. In the direct path, the insight or the revelation is sudden like thunder. Truth of the Self appears as lightning and illuminates one’s being in a flash. The ignorance drops away as if it never was and one is at ease with one’s nature. Buddhists call it the Original Face, the Buddha mind, or the Buddha nature. Hindus and Jains call it Atma Jnana, Kevala Jnana, or Moksha. On the other hand, in many schools of Hinduism, the emphasis is on works and on spiritual practices such as meditation, pranayama, fasting, etc. Similarly, in Jainism, the spiritual aspirant must bravely work out his/her karma (destiny) in this world following the path of forgiveness, compassion, and nonviolence. This was demonstrated over 2600 years ago by the Tirthankara Bhagavan Mahavira who bore physical and mental hardships with a feeling of amity and nonviolence towards all living beings. Eventually, as his karma dropped, the heavy burden of his soul becomes lighter and led to Self-Realization and Kevala Jnana (Which Jains view as Omniscience). We see that in Jainism, the actual working out of karma through indifference to suffering, doing good deeds and by cultivating universal love for all beings is emphasized. The same is true in most schools of Hinduism. Even in Buddhism, originally Buddha taught the doctrine of effort and walking the spiritual path with care and compassion. Buddha’s last words to his students are said to be, “Work out your salvation with diligence.” Essentially, Buddha was saying to his students that after receiving his teachings, it was up to them to walk the path and attain their Buddha nature. Where is the Truth in this Forest? So then where lies the Truth of Enlightenment? Is the Truth of Realization achieved through walking the path gradually and carefully while engaging in spiritual practices? Or is Realization attained suddenly through a Zen like Satori or when the Zen master does something strange and shocking as depicted in many Zen stories. 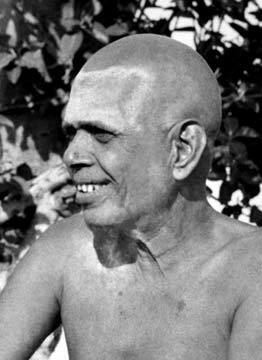 Can Realization really come unannounced knocking at the door as was the case with Sri Ramana Maharshi? 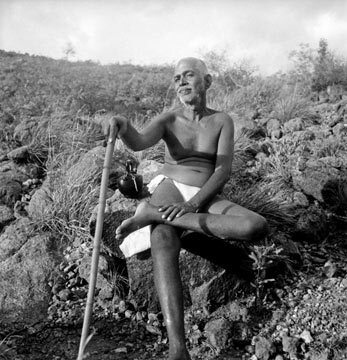 Sri Ramana, the great sage of Arunachala, has simultaneously endorsed both perspectives and said that the Truth of the Self is indeed simple and within everyone’s grasp. We simply mix the underlying feeling of “I AM” which is there in all of us (and always the same from childhood to old age) with the circumstances of our life, and the ever changing currents and patterns of our mood and personality. The self-feeling of existence, the “I AM” which animates our life and consciousness and gives light to identity becomes invisible and goes in the background as we become captivated with our perceptions and invest in our daily relationships. That is only according to nature, and one is meant to engage in these things. All relationships inevitably end. Even when we love someone dearly and they love us, eventually we are separated through circumstances, old age, or illness. If someone is married for 50 years, there is no guarantee that they will make it another year or another 10 years. In due time, one person will pass away due to old age or illness or another cause. Coming together and separating are the nature of life. Underlying all these events and relationships is the silent presence of “I AM”. If we are paying attention we can feel it. In our quiet moments it comes upon us and we can stay with it. The truth is so simple and ordinary and that is why we take it for granted. If we remain with this self-feeling of existence, the stainless “I AM” free from the contents of the mind, we can come to see the value and beauty of it. It is only pure being. Our own being. The spiritual effort needed in terms of meditation and inquiry, to make the mind subtle and to refine the intellect so that this simplicity of being can be grasped with immediacy and certainty, should not be dismissed. If some people do not need such efforts and can recognize the truth of their being immediately by hearing someone restate or paraphrase what the ancient sages have said, that is wonderful indeed. It shows that their mind already had requisite subtlety, depth, and maturity. If there is a deep sense of quiet within, it can be like a mirror and we can see the image of “I AM” reflected in the mind. I am reminded of that passage where God said to Moses, “I AM That I AM”. I am not a scholar or religious expert but sometimes it seems to me that this is a symbolic message telling us to pay attention to the “I AM” within because it is God sitting in our own being and Heart saying, “Here I AM, I AM, Come to Me”. It is said that man (woman) was made in the image of God. If the nature or identity of God can be described best as “I AM THAT I AM” it stands to reason that the nature of Man (Woman) is also similar. Our essential nature can be captured by this feeling we all have; the simple feeling of being-existing, free from conflicts, “I AM”. According to Advaita, this “I AM” within us is the link to God. Prayer, meditation, contemplation all make us reflect on this sense of being within us. The state of the Self is natural. Easy and natural because the Self remains as It Self. It is devoid of sorrow and has nothing to attain being whole and complete and what the Advaita scriptures refer to as One without a second. Sages called this Realization the Sahaj state. Sahaj in Sanskrit means easy and natural. That which requires no effort is Sahaj. To understand the Sahaj state of the Self, we can start and reflect on our body and see what is natural to it. What is easy and natural differs among people. Some people are able to sit in the lotus posture in an easy and natural way (see the picture of this young woman at www.harshasatsangh.com sitting in the lotus posture). However, the lotus posture is not easy and natural for everyone. For most people, to sit like that would hurt their knees and ankles and is very uncomfortable. God did not say to Moses, “Here I Am, sitting in the Lotus Posture.” God only said, “I AM THAT I AM”. The feeling of “I AM” within us is independent of posture. Physical postures pertain only to the body and not to the spirit. In life and on the spiritual path we have to see what is easy and natural for us. For some, walking is easy and natural and such people practice their prayers, mantras, and pranayama taking a morning stroll. Others are not satisfied unless they lift very heavy weights and scream “Oh God”, “Oh God”, and breathe rapidly and heavily. This is their form of being natural. For such people becoming very muscular becomes natural. If you were to tell weight lifters to take it easy and just take a nice walk every morning, they would not agree to it. They like to have big muscles and low body fat. That is natural for them but not for everyone. In Bhagavad Gita, Sri Krishna tells Arjuna that actions and paths of people differ according to their natural inclinations and therefore one should follow one’s own Dharma not someone else’s. In other words, we need not seek or follow someone’s path because it may not be natural for us. We should be natural, authentic, and true to our self. Without it, there would be inner conflict which is not conducive to being quiet and meditative. What Path Should One Follow? In this essay, I have suggested that the philosophies and perspectives of the gradual or the direct path are not inherently meaningful. Their truth lies only in being teaching tools. Words and concepts such as the “direct path” and the “gradual path” are meant to point at the truth but they are not themselves the truth. The Truth must reveal itself to us in our own Heart. Being rigid in one’s view, one misses the obvious. Both the notion of “direct” and “gradual” depend on each other for meaning and have no basis in the Reality of the Self. According to Advaita Vedanta, the Self Always Is. It cannot be seen by “another” directly. Neither is it approached by “another” gradually. Self Reveals It Self Alone to ItSelf. To understand it in plain English, you can say to yourself, “I am always going to Me. And Here I Am.” Just stay with that. The nature of the mind is to hanker after that which is not real and is constantly subject to change. Not knowing who we are, where we come from, and where we are going, we still continue chasing after dreams built on the sand castles of desires. If we become aware of this, we can see the primary nature of suffering, and direct our attention to the mystery of life and the nature of our perceptions. 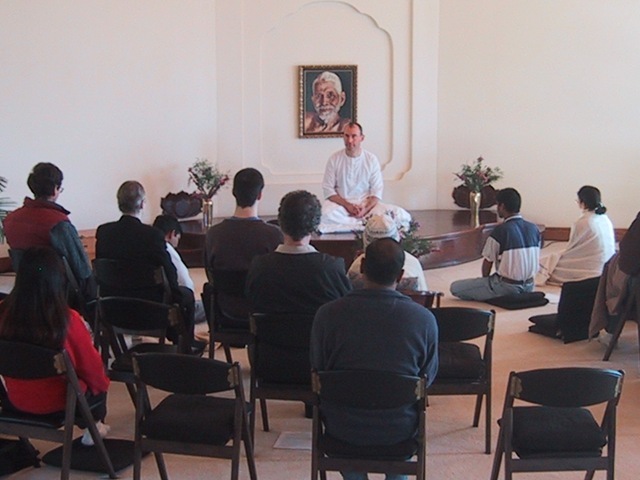 In Indian spiritual traditions, a guru serves as a conduit to help us along the path. However, many things we hear about gurus these days are not appetizing. Still, if we realize the truth of the pure teachings, that the Supreme Reality is indeed our own Heart which guides us, then we can walk the path lightly without being misled. The Self Always Reveals It Self from Within. Listen. Remain aware. Be utterly indifferent to the clever words, miracles, and magical techniques that promise salvation. If you have the courage, open your wisdom eye and see clearly what attracts you to such things and people. What is it that these gurus have to give you that you do not have? Question seriously and honestly and investigate the root of your hopes and fears. There are many active marketers of “spiritual wisdom.” It has now become a public relations game with the many modern gurus as they compete in the free market of spirituality. Many spiritual teachers today attempt to distinguish themselves on the basis of their “enlightenment”, their spiritual experience, and how “awake” they are. Some claim that by their magical touch, shaktipat, or willpower, they can create miracles and remove obstacles from someone’s path. We cannot say that all such teachers and gurus are good or bad. But we have witnessed enough scandals among spiritual teachers to conclude that there is a need to be alert to the human tendency of those in power to exploit others financially and even sexually. Some teachers, giving satsang, and teaching yoga and advaita, are no doubt good and genuine people, but others may be quite ignorant and have generally bad tendencies. I will share with you briefly a story. One time, I was walking my teacher, Chitrabhanu-ji, back to his apartment and we were speaking about the guru-disciple relationship. During the conversation, he said to me, “You should never follow any guru.” I was quite surprised to hear him say that because you see Chitrabhanu-ji was my spiritual teacher and mentor and I referred to him as Gurudeva. All Indian spiritual traditions in Hinduism, Jainism, Buddhism, in fact, have the guru-disciple relationship at their core. So I asked Chitrabhanu-ji, “Gurudev, why do you say this? 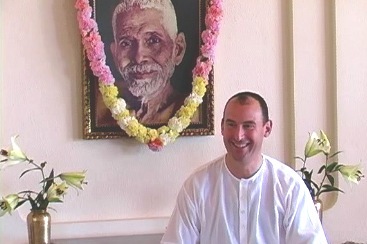 Why do you say that I should never follow any guru?” My teacher smiled and said, “Well, what if the guru goes crazy and starts acting nutty?” So I had a good hearty laugh. My teacher, Gurudev Chitrabhanu-ji, was also my friend. I was only 21 when I met him. He was then 56 and now he is in his mid 80s (written in 2006). During the time spent with him, I had the sense that he wanted to make sure that I understood the realities of life and was fully independent and able to think on my own. His success as a teacher was that he made me independent of himself as well. Chitrabhanu-ji used to say that…” a real guru is like an ice cube. He cools your consciousness and then disappears without a trace.” From my teacher I learned the sacred philosophy of Ahimsa (harmlessness), which is the cardinal principle of Jainism. Mahatma Gandhi of India was an exemplar of the practice of Ahimsa in the last century. After some years, when I left my teacher to go back to graduate school, he said that I should always remember the principle of Ahimsa and keep that as my ideal. From Ahimsa follows being able to understand many different points of view and to approach situations with awareness and compassion. During the years that I studied with my teacher, he never asked me for anything. No money, nothing. Actually, I had nothing to give. At that time I used to teach yoga to earn a livelihood and it was barely enough to pay the rent and eat. Sometimes I see gurus who treat their students badly and even exploit them financially and in other ways. I see the huge contrast between that and how my teacher treated me, despite my youth and immaturity, with the utmost respect and courtesy as a human being and his equal. So I tell students on the spiritual path that it is never a good idea to hang around a so called guru or a spiritual teacher who demeans you or insults you or disrespects you in any way. It does not matter if such a person is charismatic or if your friends adore him or her. In Patanjali’s ancient yoga sutras, Ahimsa (harmlessness or nonviolence) is mentioned as the first principle of yoga. A guru or a teacher whose words and attitude carry and convey violence cannot be good for you. 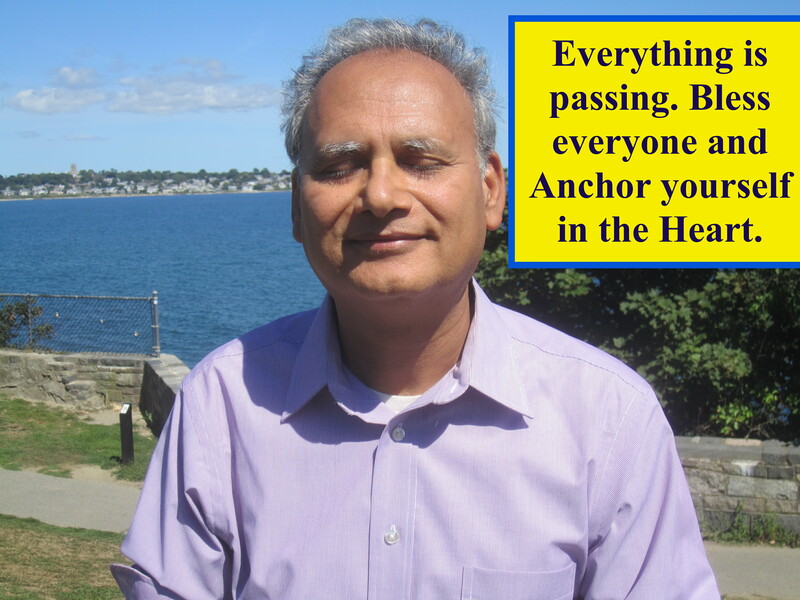 Understand that, like you, most gurus and spiritual teachers today have their own personal challenges and suffering. You need not judge others too harshly. Yet at the same time one must be free to follow one’s own vision. With compassion for others and one’s own self, one should keep one’s focus utterly, totally, and completely pure. This means that you should not give in to the attraction of confusion, and compromise in seeking the Truth by creating a permanent dependence on another person. If a guru creates circumstances and subtly encourages you to do become dependent or submit to his/her will, know that such a person is controlled by his or her own power needs and greed. What can such a person give you? I pass this on to you. No one can give you the Truth. Truth is always revealed from the inside. And when it comes, you see that your own essence is that of Truth. That is our mystery that the perfect and complete love that we long for is ultimately seen in our nature and our own heart. The ancients called it the Heart, Sat-Chit-Ananda, Existence-Knowledge-Bliss, which is our very being. Do not settle for anything less than the Heart, your own Heart. Do not settle for anything – keep going until there is nothing left to settle for. Let your effort be absorbed in peaceful Self-awareness. There is absolutely nothing else to be done. now or at some later date. That You Are Already Wide Awake! Abide in that Heart of Being.